Among upper-class people it became popular to eat shrimp in Sweden in the 1500s. Common people however perceived shellfish as insects and unclean to eat back then. Therefore it was not until the 1800s Denmark and Norway began with a more systematic shrimp fishing and not until the 1900s Sweden followed in their footsteps. More specifically shrimp fishing in Sweden started in Kosterfjorden in 1902. Today there are around 200 shrimp boats in Sweden. 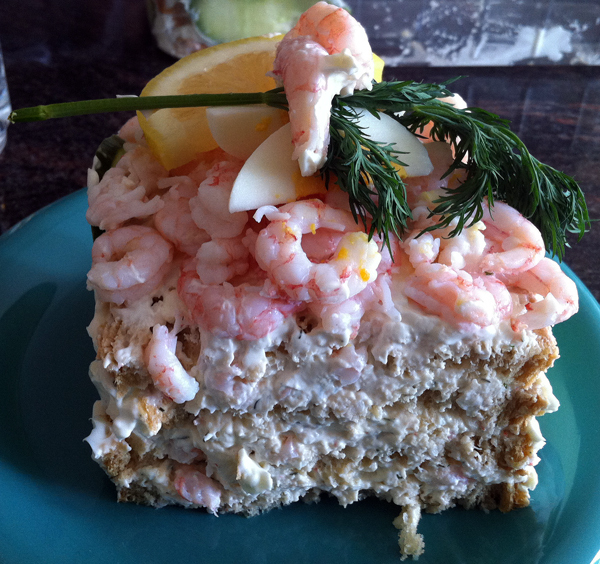 Now the origin of the Swedish Shrimp Sandwich can be traced back to Denmark in the 1800s and their special Danish Sandwich called Festsmörrebröd. A Danish Festsmörrebröd was usually made with bread, butter, at least one meat spread, sauce and garnish. It is assumed that the Shrimp Sandwich made its way to Sweden via the regular ferry traffic, which began in 1872, from Denmark to Skåne and Gothenburg. The Shrimp Sandwich then spread throughout Sweden and in the 1950s it started to show up at certain restaurants as a small lunch dish. It is however uncertain when Shrimp Sandwiches started to appear in coffee shops around the country. Today the Shrimp Sandwich is most associated with air travel and other travel in Sweden. In fact a total of 7000 Shrimp Sandwiches are sold per week at Arlanda Airport in Stockholm and Landvetter Airport in Gothenburg, that means 364 000 sold Shrimp Sandwiches per year. To make all these sandwiches it takes a total of 60 ton of shrimps, 42 ton at Arlanda and 18 ton at Landvetter. In fact, these two airports have on their initiative declared October 14th Shrimp Sandwich Day. A traditional Shrimp Sandwich consist of bread, butter, shrimp, mayonnaise, egg, a vegetable, a slice of lemon and a sprig of dill. Some versions also include a few slices of red onion. To get the absolute best taste the shrimp should be fresh and newly peeled. Now I LOVE Shrimp Sandwiches, and most seafood/shellfish, but peeling shrimp is so boring! Therefore when I make Shrimp Sandwiches (like the one in the photo below) I usually use refrigerated already peeled shrimp preserved in a sort of saltwater. 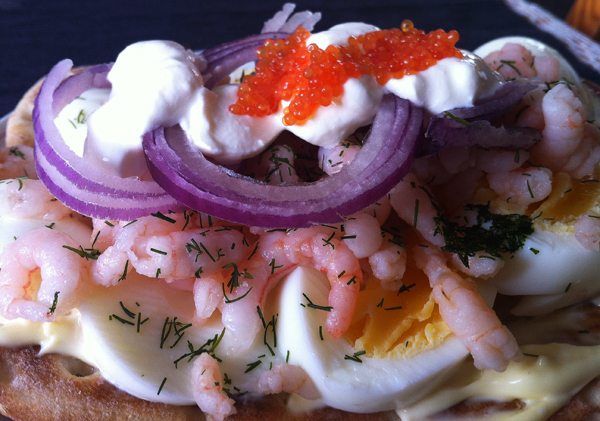 I also use bread, mayonnaise, egg, red onion, dill, lumpfish roe and a few splashes of lemon juice. So the Shrimp Sandwich Version in the photo, that I ate a few days ago, only took a few minutes to make and tasted sooo good!! !